Defense Hawks and those of us on the Libertarian Right who are concerned about the rising threat from Islamic Radicalism have repeatedly argued that NeoConservatives are just fair-weather supporters of the War on Terror; that they're more concerned about protecting the interests of international bodies and less concerned about protecting the American homeland and of our Nation's sovereignty. At least one prominent NeoCon is proving Pro-Defense critics right. The Village Voice described Newsweek Editor Fareed Zakaria in 2005, as a "NeoConservative Muslim Heartthrob Superpundit." 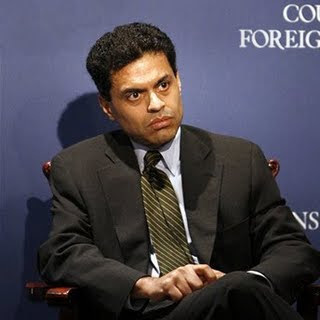 He is known as a deeply rooted "multi-lateralist" For example, Zakaria supported the War in Iraq in 2003, but only if it was run by the United Nations. Now Zakaria is living up to that standard with a decidedly soft on Radical Islam approach. His latest syndicated column from the Washington Post: "Obama Betting That Machismo Is Not A Foreign Policy." The editorial praises Obama's speech to the United Nations, and harshly criticizes critics of the speech on the Right. For Michelle Malkin, the speech was evidence that Obama was "the great appeaser"... For Rush Limbaugh, Obama's speech was "basically a coup against America." Obama's outreach to the world is an experiment, and not merely to see if the world will respond. He wants to demonstrate at home that engagement does not make America weak. For decades, it's been thought deadly for an American politician to be seen as seeking international cooperation. Denouncing, demeaning and insulting other countries was a cheap and easy way to seem strong. In the battle of images, tough and stupid always seemed to win. Obama is gambling that America is mature enough to understand that machismo is not foreign policy and that grandstanding on the global stage won't succeed. In a new world, with other countries more powerful and confident, America's success -- its security, its prosperity -- depends on working with others. It's a big, bold gambit. I hope it works. Of course, Pro-Defense advocates would argue, that it's precisely weakness that the radical Islamic enemy thrives on. The more weakness they sense, particularly in American will to fight and commit to a long struggle such as Afghanistan, the more they will be emboldened to escalate their insurection. Let's hope Republicans who are committed to a Strong on Defense policy, or as Zakaria calls it a "Machismo" approach, win coming elections in 2010, and 2012, and that the Zakarian NeoCons are marginalized in future foreign policy debates. Otherwise we could see a resurgence in Islamic Radicalism in Afghanistan, Somalia, and maybe even the rise of Muslim terrorist cells here in the United States. Or perhaps, Obama's Girlie Man approach to foreign policy has already produced that result? Additional Information: Libertarian Republican article, Oct. 20, 2008 - "Muslim NeoCon Fareed Zakaria, Editor of Newsweek International, endorses Obama for his Globalist perspective."